Backed by Australias biggest bike store. 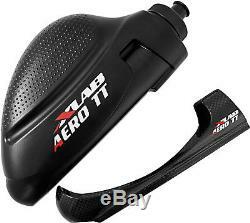 XLab Aero TT Cage and Bottle Frame System Black/Black 590mL. X Lab aero TT bottle, now with the X Lab Aero Carbon cage. Constructed from BPA Free Polyethylene. Match your black Torpedo Bottle or kit-match your bike! Carbon Cage Capacity: 590ml Cage Grip Force: 2.7 kgs approx Colours: Translucent Matte Black bottle with white/red logos Weight: System: 90g (3.12oz) approx, Cage: 31g (1.11oz) approx. These charges are your responsibility. All items are securely packed in protective mailers or cartons. Please call or message Pushys Online Customer Service if you have any questions. SIGN UP TO THE PUSHYS NEWSLETTER. The item "XLab Aero TT Cage and Bottle Frame System Black/Black 590mL" is in sale since Tuesday, March 6, 2018. This item is in the category "Sporting Goods\Cycling\Bicycle Accessories\Water Bottles & Cages". The seller is "pushys" and is located in Brisbane.